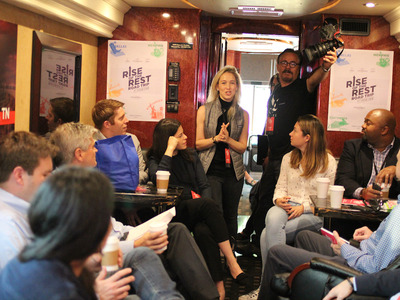 RevolutionThe Rise of the Rest bus usually had around 20 people crammed in tight. That’s me in the back, in the green shirt. 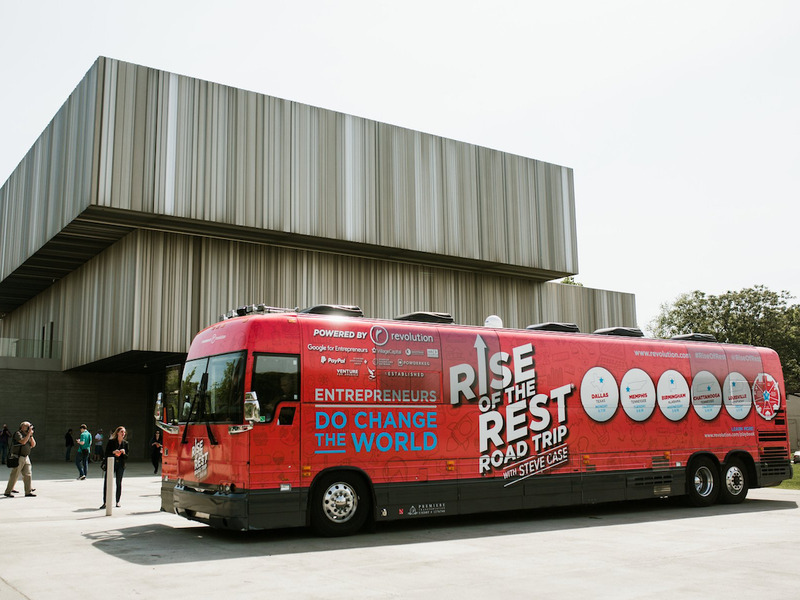 For the last four years, AOL cofounder Steve Case has led seven “Rise of the Rest” bus tours across 38 cities, in a total of 26 states. On these tours, he meets with cities’ power brokers and ends each day with a pitch competition for entrepreneurs with a $US100,000 prize. 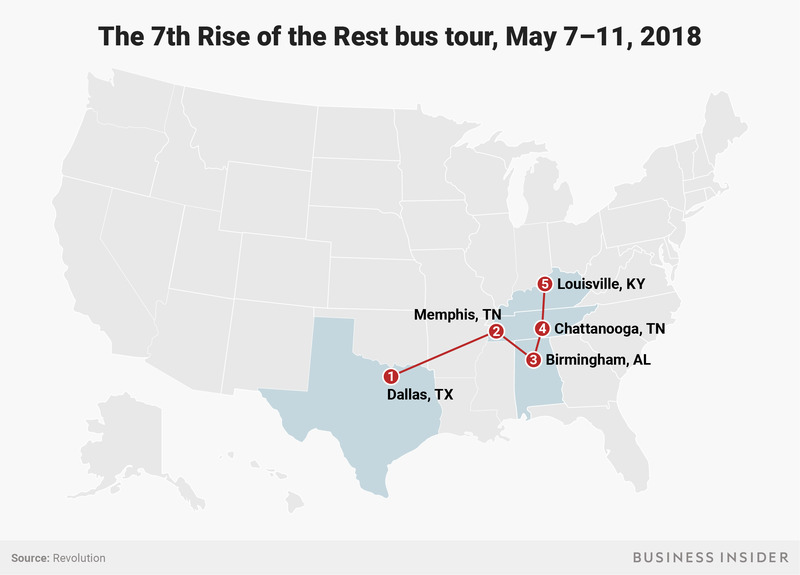 I joined the tour for the last two stops of its latest journey, in Chattanooga, Tennessee and Louisville, Kentucky. I found the “stunt” intentionally grabs attention, and that the tour’s value outlasted its day in town. 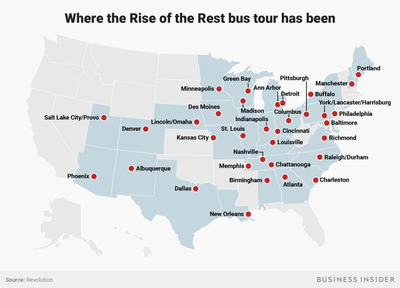 This article is part of Business Insider’s ongoing series on Better Capitalism. I only spent two days with AOL cofounder Steve Case and his team in May, but they were virtually nonstop. Each time, we were part of the biggest show in town. 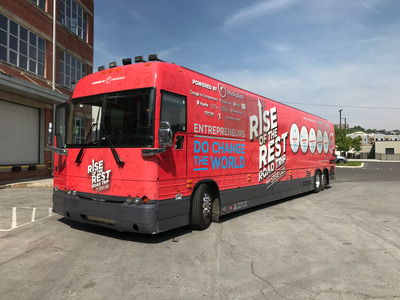 I joined the last two days of the latest Rise of the Rest bus tour, as it passed through Chattanooga, Tennessee and Louisville, Kentucky. It’s an initiative Case has been running through his Washington, DC-based venture capital firm, Revolution, for the last four years. 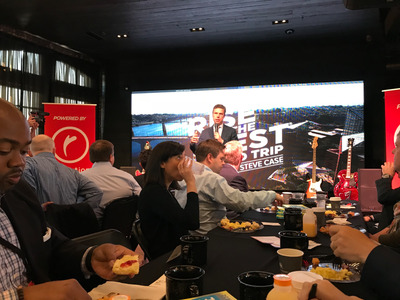 In each tour, Case and his team meet with the city’s power brokers and end the day with a pitch competition with a $US100,000 prize. 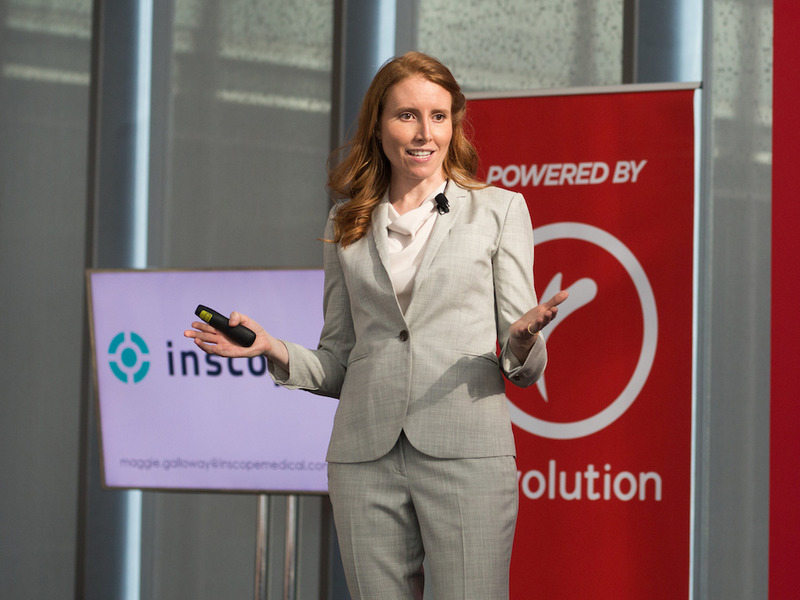 This past tour was the first to draw that money from a $US150 million seed fund Revolution raised last year, featuring more than 30 high-profile investors serving as limited partners who give their money but not their counsel. They include Amazon CEO Jeff Bezos and Bridgewater Associates founder Ray Dalio. Case put JD Vance, “Hillbilly Elegy” author and former Valley investor, in charge of the fund. Here’s what it was like. The Revolution team rents a luxury coach bus and wraps it in a bright-red full-body sticker covered in logos. It sticks out wherever it goes. 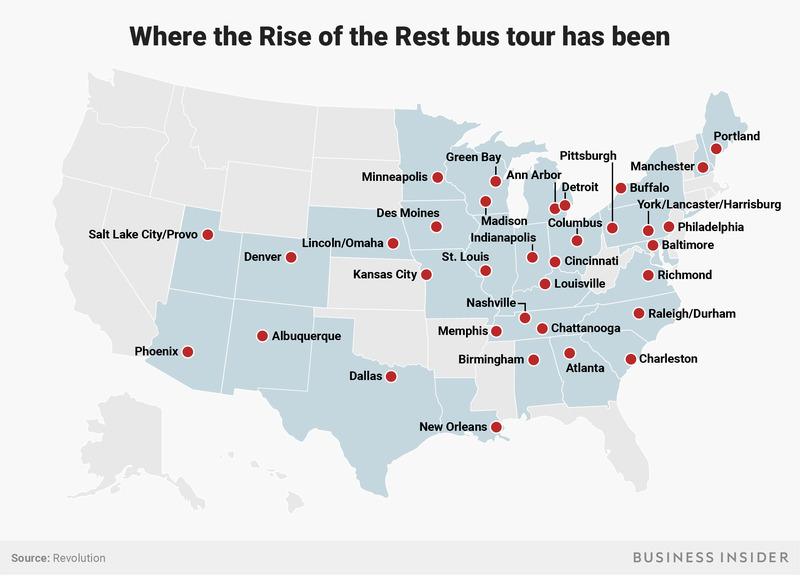 This was the seventh bus tour, roughly focused on the southeast. The bus went from Dallas, Texas, to Louisville, Kentucky. The days each lasted about 12 hours, lasting roughly from 7:00 in the morning to 7:00 at night. The bus was almost always packed tight, and we always had photographers and videographers floating around. On our way to the opening breakfast event, we stopped by the Chattanooga Choo Choo, an old train terminal converted to a hotel. The bus tours make sure to include as much local iconography as possible. 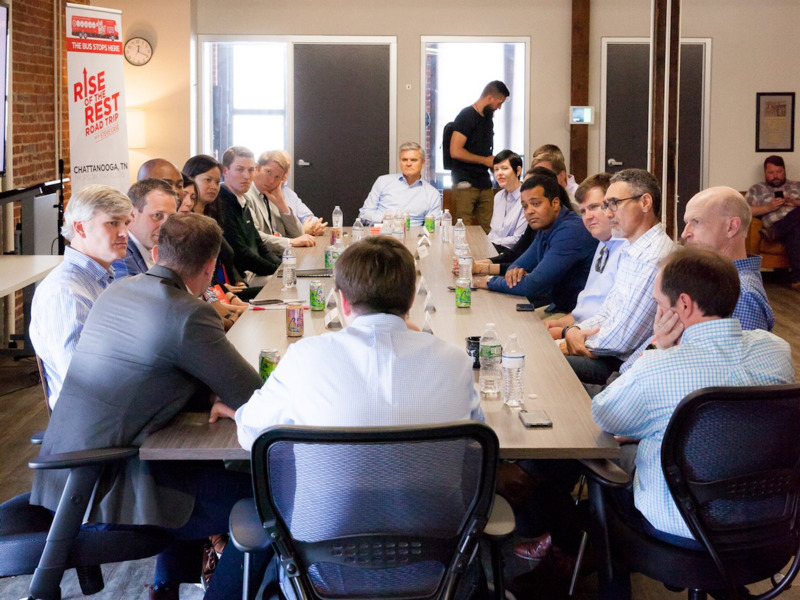 “I see what’s going on in the next wave of innovation, the next wave of technological change, as really depending on things that places like Chattanooga are good at, as opposed to the things that Silicon Valley are good at,” Vance said at the breakfast event we attended. 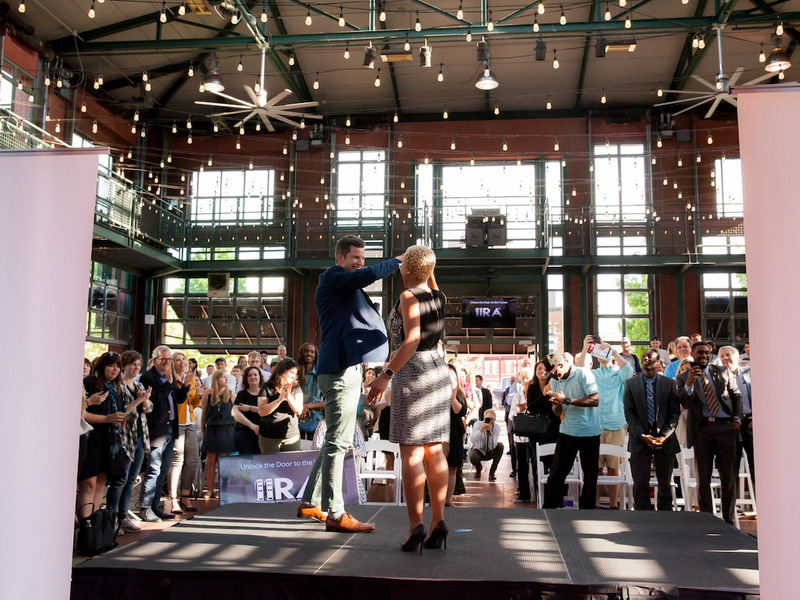 Mayor Andy Berke took the stage to talk about the way he’s used his term to orient his city around entrepreneurship. 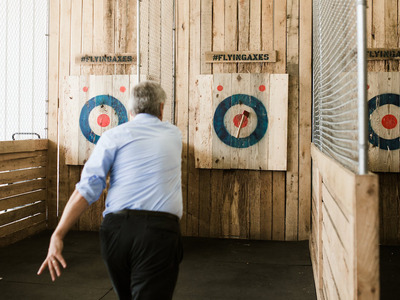 “The city I grew up in was a city that was dying,” he said, explaining that he has a personal stake in seeing the city thrive. It was a common local sentiment. 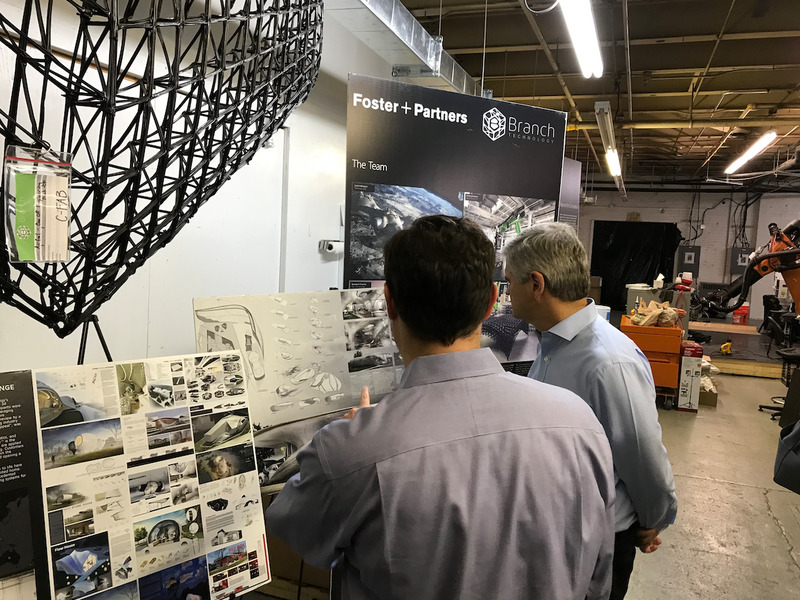 We stopped next at Branch Technologies’ robotics factory to check out how its 3D printers are being used for architecture. 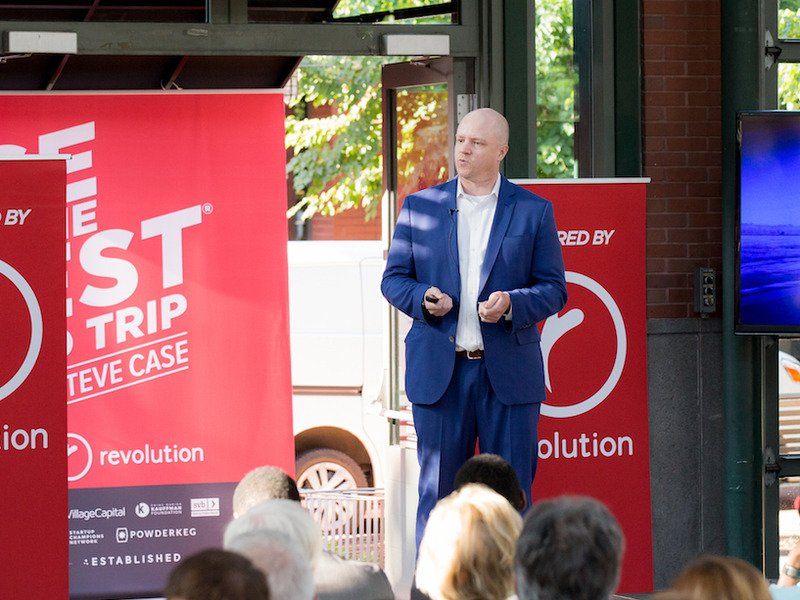 Revolution invited local media for the ride, and Case told me that one of the missions of the bus tours is to make locals aware of what’s happening in their own city. The Rise of the Rest partners had a chance to meet with some of the entrepreneurs who would pitch to them that evening. Here, Rise of the Rest partner Mary Grove checks out offerings from Aegle, which makes next-gen scrubs for healthcare professionals. At a roundtable in the offices of moving company Bellhops, a local success story, the desire among fellow founders to see each other succeed was obvious. 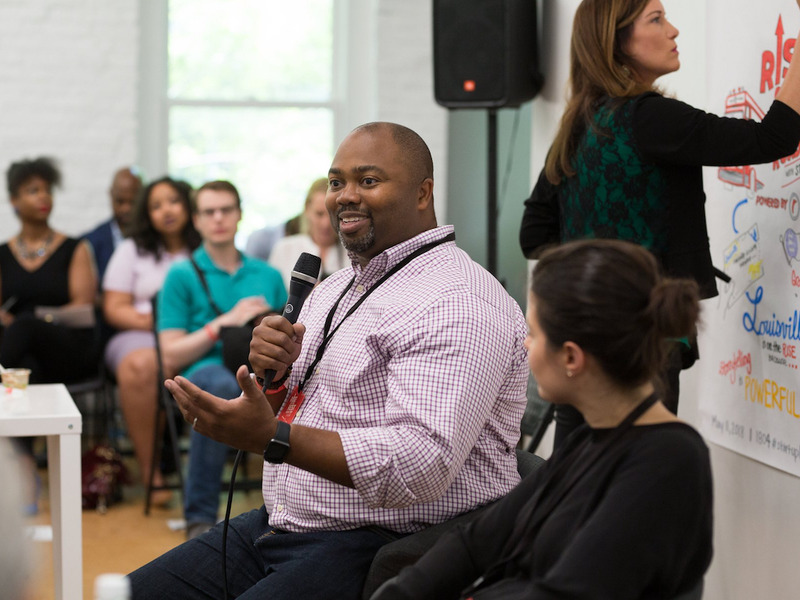 A theme was, “We need to tell our story better,” and the tour was helping them solidify a narrative. 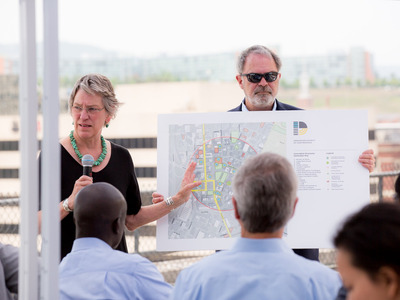 We had lunch on the roof of startup accelerator Co.Lab’s building, a project overseen by the mayor that is now the heart of Chattanooga’s innovation district. 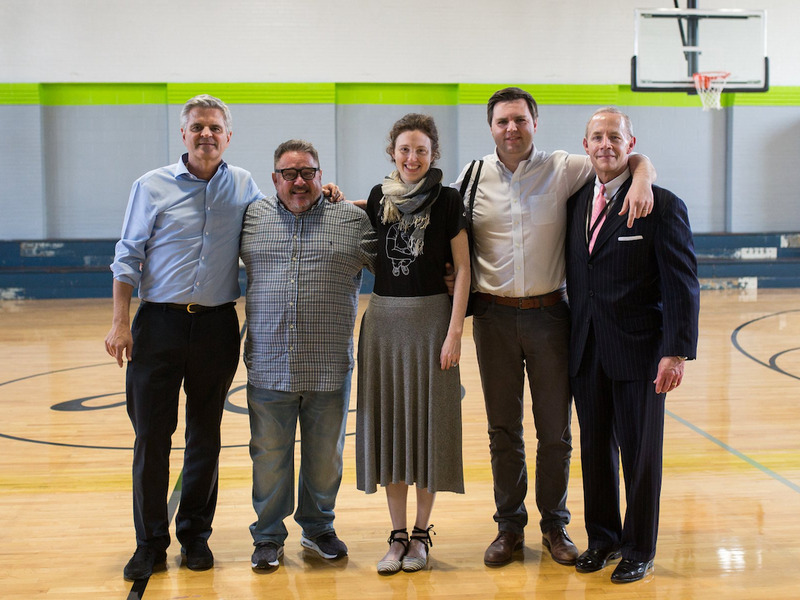 We took a look at a map of the 140 acres the mayor set aside specifically as a place for startups to grow. FreightWaves CEO Craig Fuller won the $US100,000 prize. 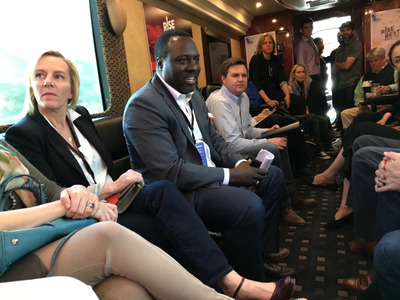 FreightWaves is like a Bloomberg for the freight industry — which thrives in Chattanooga — and it’s already poised to bring in $US13 million in revenue this year. “We want great returns for the fund but we also want to showcase the companies to others,” Case told me. Instead of staying on the bus that night, I took a flight to Louisville and got to my hotel around 1:00 a.m. Seven hours later, it was time for breakfast outside at the Angel’s Envy distillery. Kentucky Governor Matt Bevin, center, sat next to Case and mingled with Louisville entrepreneurs. 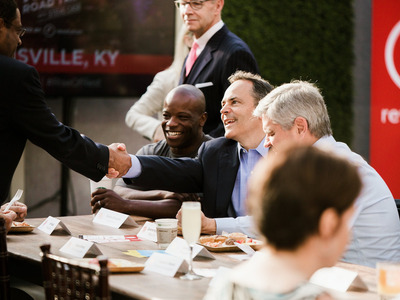 Bevin, Mayor Greg Fischer, and Sen. Rand Paul all gave speeches. 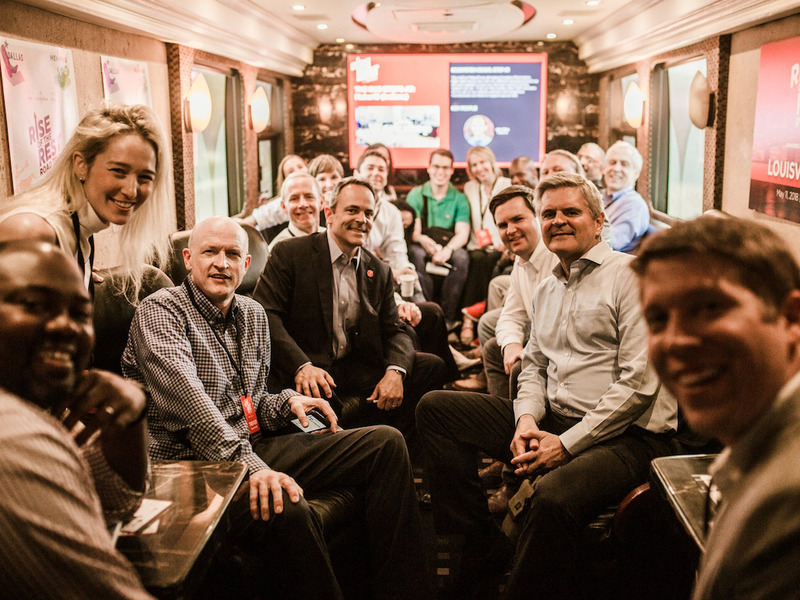 The governor joined us on the bus for a bit and had a lively discussion with Vance — I even saw him ask Vance for his autograph. After checking out some businesses right over the border in Indiana, which has a close working relationship with many Louisville companies, we headed to Flying Axes, a fast-growing startup that offers an experience kind of like going to a bowling alley … with sharp blades. 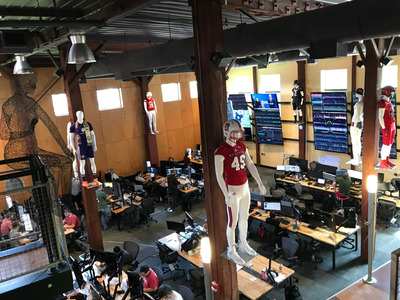 We stopped by online ad company El Toro, which Deloitte named the 13th fastest-growing company in North America last November. 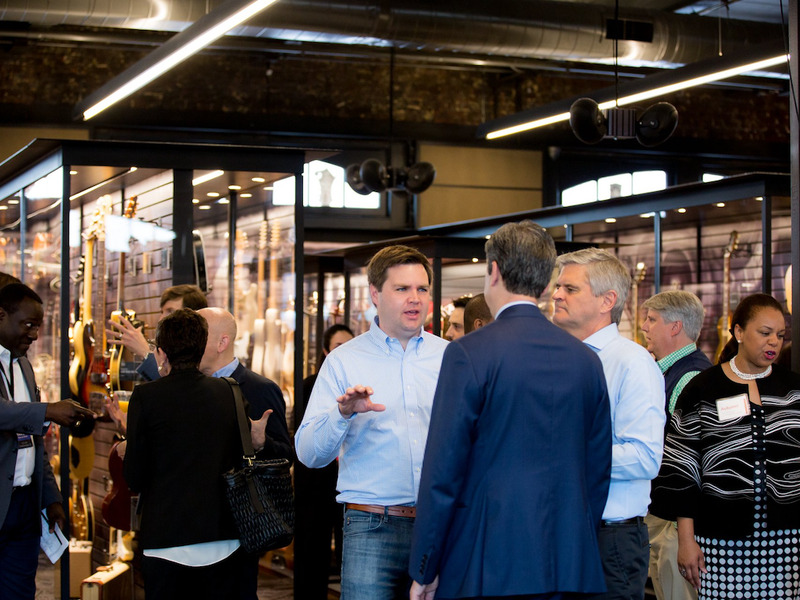 Seeing established companies during the tour serves as beacons for what emerging startups in the region can aspire to. 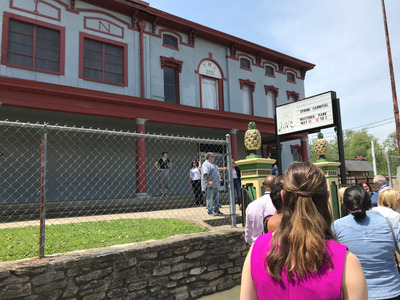 We eventually made it to 1804, an entrepreneurship center that was created after Case visited Louisville in 2016 and suggested consolidating the city’s entrepreneurial resources. 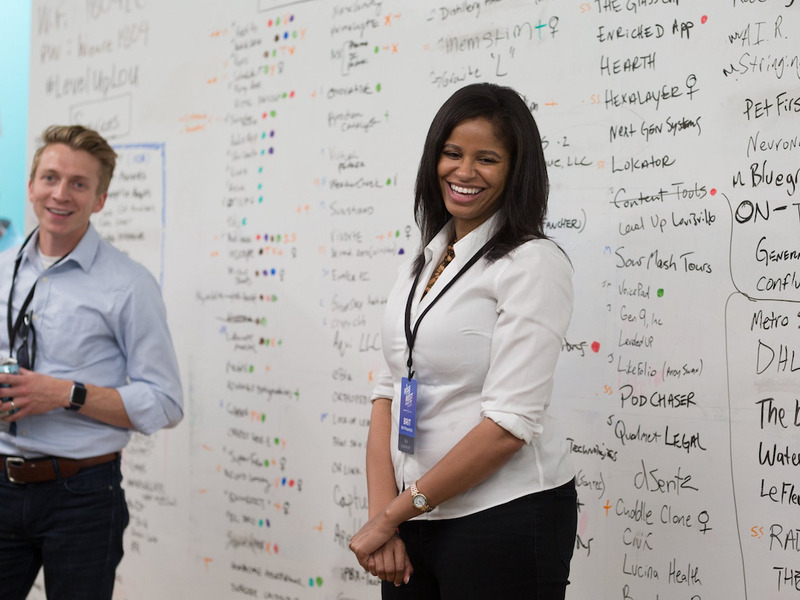 Here, 1804’s cofounder Madison Hamman and head of business development Brit Fitzpatrick stand in front of a list of all the startups in the city. The last stop before the pitch competition was Love City, a community center that just reopened after a $US25,000 refurbishment courtesy of Google Fibre. It’s served hundreds of people in the impoverished Portland neighbourhood. Love City cofounders Shawn and Inga Arvin, second and third from left, had virtually everyone in the room tearing up as they told the story of using their center to support hundreds of people in the neighbourhood, and to provide jobs for their barbecue restaurant, the only sit-down restaurant in Portland. 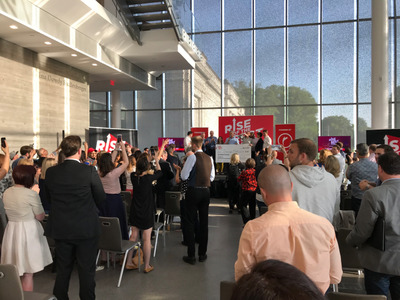 The Louisville pitch competition was held at the Speed Museum in a beautiful space that overflowed with people for the event. 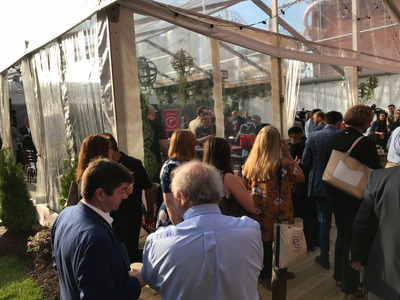 I sat next to a guy who told me he took a flight from San Francisco to Louisville, his hometown, to check out the event (which he claimed he learned about on Business Insider!). He probably read our story on Revolution’s high-profile investors, or Case’s op-ed. Maggie Galloway, CEO of medical device company Inscope Medical, gave the winning pitch. 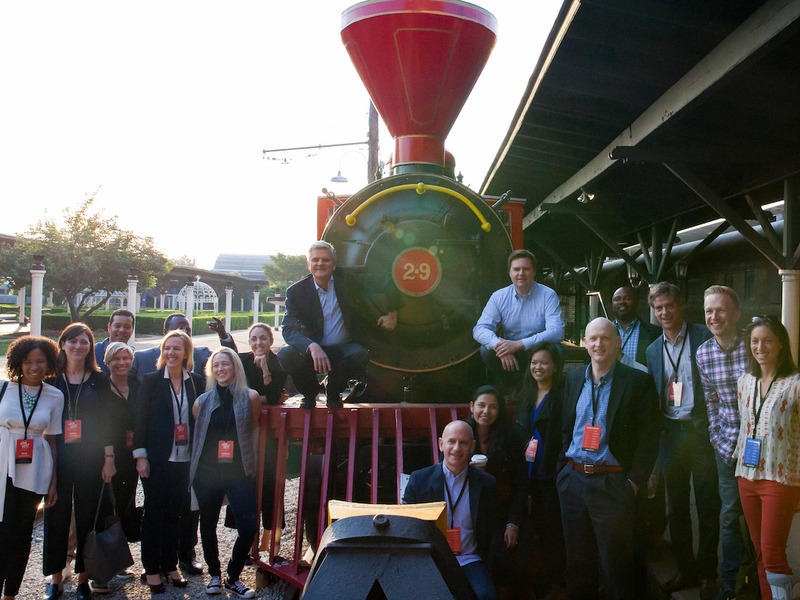 In the same way FreightWaves won in a city with a vibrant freight industry, Inscope won in a city where healthcare is one of the premiere industries. The Rise of the Rest bus tour has now been in 38 cities across 26 states. The team is already considering where to head next.